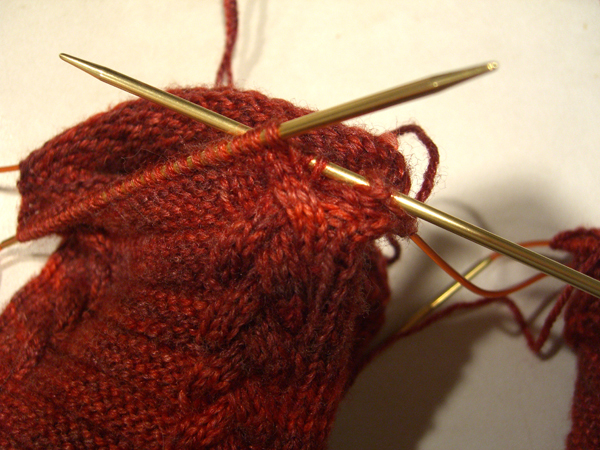 Ah… the best laid plans of knitters knitting away over and over again on recalcitrant heels. I would think that those heels were trying to tell me something, except this little issue cropped up only on the third heel iteration — the successful one. If it ain’t one thing, it’s another. You can see it. Right there where the blue arrow is. 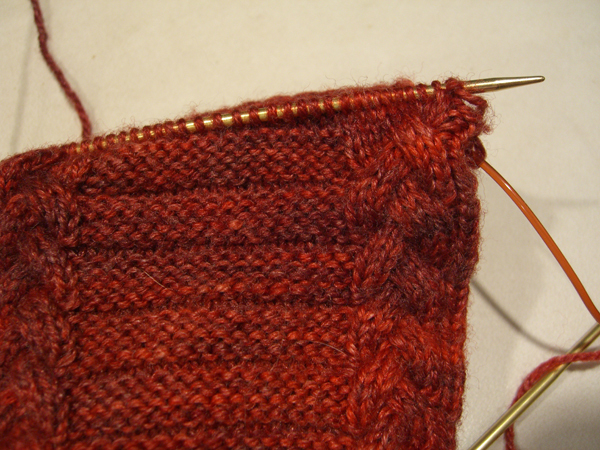 I crossed the middle three stitches over the right-hand three stitches instead of under them. In fact, you can see it in the final picture from my last post — the I have a happy heel and red toes and I’m oh so smart post. It’s right there. I didn’t even notice. 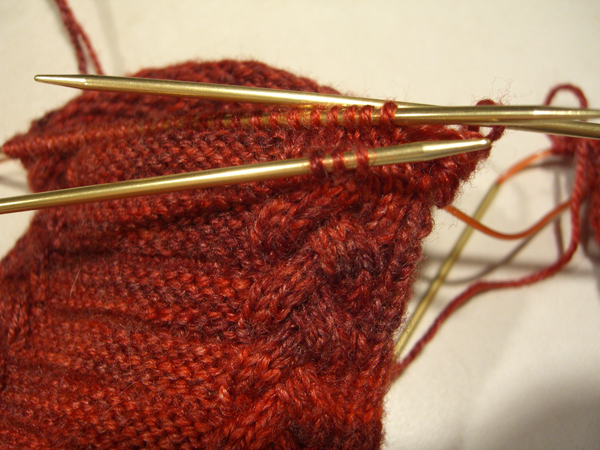 Monday at knit night – a knit night that I rarely get to attend but which is always tons of fun – I finished the second heel and turned blithely to the instep and knit across the first sock, turning cables as I went. I reached the second sock. I went to turn the cable. I am sorry to report that I may have said a few rather unladylike words even though there was a baby present. I’m not sure. I really don’t remember. I only remember sitting there in horror and frustration and saying I will not rip those heels out yet again! Can’t you just fix it without ripping? Asked Bobbie. Once at home, I stationed myself in my brightly-lit kitchen. Now brightly lit, anyway. Gentle reader, have you ever noticed how all of your kitchen lights (assuming you have more than one) burn out at the same time? A couple of weeks ago (three? four? ), one of the 7 spotlights in my kitchen burned out. Soon after, another one followed. I started thinking that I really needed to remember to pick up bulbs when next I was at the store. But, somehow although I could remember kitty litter and coffee and bananas, light bulbs totally escaped me at every store visit. Until I got home and turned on the kitchen light and another bulb went pop-sizzle-snap and the kitchen got a little darker. And then I’d think to myself, I really must remember to pick up some bulbs when next I’m at the store. I was down to the bulb over the sink and was cooking mostly by feel when I finally remembered. My kitchen is now a brightly-lit place, but not a place really conducive to taking pictures of shiny knit objects. But I don’t think I did too badly. At any rate, while waiting for dinner to cook, I stationed myself in the kitchen – now the most brightly lit room in chez PI – and began surgery on the mis-crossed cable. 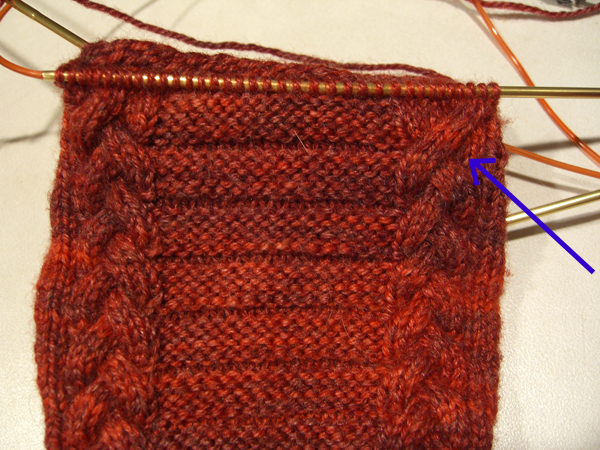 The first step is to carefully tink just the three mis-crossed stitches back a few rows to the row where the cable was actually crossed. Note that I could have tinked back either the three stitches wrongly crossed over the top, or the three stitches wrongly crossed underneath. I chose to tink on top because those were the first three stitches I came to when working across the instep of this sock. Once the stitches were tinked back and I was back to where I started, so to speak, I could cross the cable the correct way. All I needed to do was poke the stitches through the little hole that the crossing makes and pick them back up on the back side. Well, it was a little tricky. Because this is a sock and my gauge is fairly small, I kept the stitches on a spare needle end with the point towards the right. Then I poked the stitches through to the back side, and transfered the stitches to a spare needle end with the point toward the left. Now I had the cable crossed correctly, and the only thing left to do was to re-knit those stitches up the rows that I had tinked out. The strands of yarn for those rows were just sitting there waiting for me, so it wasn’t too tough to get those stitches reknit. Then I used the tip of my needle to adjust the gauge a little so that everything was nice and even and crossed the right way and the scarring was so minimal that you couldn’t even tell that surgery had been performed. Ah…. all better. The cable is crossed the right direction and the order of the universe is restored and I can go ahead and start knitting away on the ankles, around and around and around. Thank you to everyone who commented on my last post. You gave me much to think about. Most of you talked about knitting socks. Which is no surprise because we talk about socks a lot here. Like, obsessively. Every year I make a resolution to knit fewer socks and more other objects. You can look at the sidebar to see how well I’ve done this year. Yeah. Not a pretty site. Are you as likely to frog a sweater or scarf or hat as you are to frog a pair of socks? Or do socks somehow seem different or special?